Solemn Judgment is a Counter Trap that reads: Pay half your Life Points when your opponent either activates Magic or Trap or summons a monster (Including Special Summon) to negate the action and destroy all the cards involved. Probably the best late game card in Yu-Gi-Oh! What I mean by this is that during the end of the game, you are most likely low on Life Points. This lowers the downside to Solemn Judgment drastically. Being able to counter those crucial late game cards that usually throw the game in your opponent's favor for a small cost is simply amazing. Solemn Judgment is easily the most versatile Counter Trap. This doesn't make it the best Counter Trap though. The reason for this is because during the beginning of the game paying half of your Life Points means there's a good chance your life will be at 4000. That's a Direct Damage player's dream. Lately I have really been liking this card. It has meant game for me on several occasions. Yesterday we looked at one Counter Trap, today we're going to look at another, Solemn Judgement. 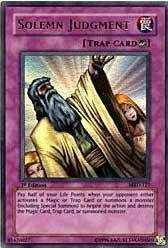 Pay half of your Life Points when your opponent either activates a Magic or Trap or summons a monster (including Special Summon) to negate the action and destroy all the cards involved. Yesterday we looked up the word "tech". If you looked closely enough, you saw at the end of the definition "Other words to look at", and one of them was versatility. We go there, and we find a picture of Solemn Judgement. This is currently, by far, the most versitale card in the English version of Duel Monsters (and one of the most versitale in the game period). It basically negates ANY card your opponent plays (Magic, Trap, or Monster), but at a very steep cost. Unlike Jirai Gumo, this cost is mandatory (if it had a flip to decide, it would probably be restricted), and the worst part is, if there's a reset or this card is negated, the life points are NOT returned (this is the same for any other card with a cost, but here it especially hurts). It is best used as tech for those situations where you are stuck and have no other options. This card can function as an extra Magic Jammer, Seven Tools of the Bandit and Horn of Heaven, in case you run out of the above. The LP cost is not really that steep late in the game, because, by then, you have very little LP to lose, and playing Solemn Judgement may win you the game. The same counters that apply to Seven Tools of the Bandit apply to this card, namely, Heavy Storm, Solemn Judgement, and Seven Tools. You could use this card to negate Heavy Storm, but only if you have other important cards to protect (Mirror Force, anyone? ), unless you want to throw half your LP out the window (well, you CAN pull combos with this in future sets *cough*Megamorph*cough*). As with Seven Tools, you should either play 1 and side deck 1 or maybe side deck 2. Most people will probably trade this card to you, since they'll be turned off by the LP cost. It is an Ultra Rare, so you may have to do some wheeling and dealing to get this. I give Solemn Judgement a 3.5. It's the most versitale card in the game, but it has a fairly steep cost. Excellent tech, however.